A cleaning woman recently found a bag stuffed with 80,000 yuan (US$11,846) in cash lying in a trash bin at a residential complex in Suzhou, Jiangsu News reported. A cleaning woman recently found a nylon bag stuffed with 80,000 yuan (US$11,846) in cash lying in a trash bin at a residential complex in Suzhou of Jiangsu Province, Jiangsu News reported. The cleaner, Chen Jinwen, handed the cash to the security room as soon as she found the bag. The owner of the cash, a man surnamed Wu, returned to look for the money two hours later. Wu said it was year-end bonus for his employees. 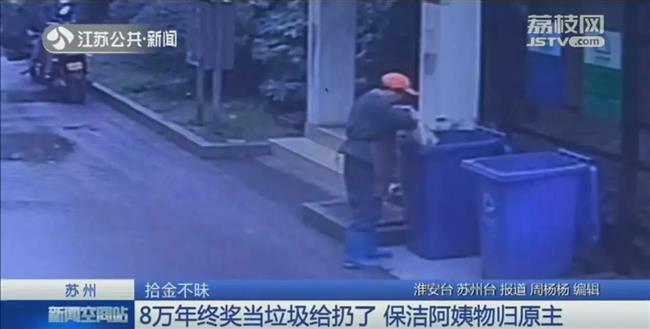 As security video shows, Wu accidentally threw the cash bag into the trash bin along with a plastic bag of household garbage when he went out in the morning.